When I was a child, autumn would always make me sad: it meant not only the end of the long summer break and returning to school, but also the beginning of 6-8 weather-wise miserable months. After I grew up and moved to the SF Bay Area, I started enjoying Fall/Winter season much more than summer for many reasons: it didn’t happen this year but usually I take my vacation in September; it’s never really cold where I live now; all the holidays during that period are my favorite; and I love “winter” perfumes much more than “summer” ones. By Kilian Amber Oud, Chanel Coromandel, Dior Mitzah, Guerlain Encens Mythique d’Orient, Serge Lutens Ambre Sultan and Parfum d’Empire Ambre Russe are just several of those perfumes, for which I need cold weather. But on top of all that there are two more words to explain why I like the cooler weather: down comforter. It is counter-intuitive but, despite the cold climate where I grew up, there were no industrially produced down duvets. There were wool blankets and comforters filled with cotton but the only down comforters I ever saw were homemade ones. My grandmother made a down-filled comforter for me and I used it for years: as a main blanket first and later, when I grew too tall to fit under it, I used it on top of my other blankets to keep me warm during those 6-8 cold months. I bought my first adult down comforter after moving to the U.S. and immediately fell in love with it. I’m not exaggerating. It was the best comforter I’d ever owned. It cradled me in a soft and warm embrace, weightlessly enfolding my body and protecting me from the cold. During the day in the office I would catch myself thinking about my comforter and looking forward to returning home and going to bed. It became a cliché and is considered almost mauvais ton in the Perfumeland to compare perfume to a cashmere wrap. I’ve never been even tempted to do so: not for trying to be original but just because that feeling is not in my active sensations “vocabulary” (a couple more years of “cashmere therapy” should fix it though, I think). But when I recently wore one of my winter (and all-time) favorites – Amouage Ubar – I realized that it evoked tactile sense I get from a great down comforter. Ubar is smooth and warm and enveloping. It feels luxurious and cozy at the same time. Kafka in her review painted a beautiful image calling Ubar “the white (floral) stallion.” I kept this image in my head for a while but over time only the color part stayed: for me Ubar is a perfect white goose down comforter, which I can covertly bring with me to the most formal party. I’m in love with this perfume and I’m glad the weather is finally suitable for both my real and my virtual down comforters. This entry was posted in "Four legs good", Favorite Perfumes and tagged Amouage, Ubar. Bookmark the permalink. ← ScentBird, ScentTrunk and Olfactif – Who’s the Fairest of Them All? Very lovely story dear Undina. In Scandinavia it would be considered as weird not having a down duvet. It would be a talking point; ‘What you don’t have a DUVET?? ?’ Something like that :-) It wasn’t until I started traveling that I learned that it wasn’t really the norm anywhere else. And cats do love duvets don’t they, my furgodchildren in particular love playing on duvets, however I can’t remember them looking quite as handsomely posing as Rusty. As for Ubar, I can’t remember it, but my luck so far with Amouage only includes Gold. Since normally Rusty doesn’t get to spend too much time in our bedroom, every time he’s allowed in there he tries to make the most of it and playing on the bed is very high on his list. When I took this comforter out of the package and let Rusty in, I had no problem taking a dozen of very cute pictures of him on that comforter. A date with down comforter? That’s a nice post you’ve written and it’s obvious you love Ubar too. I sleep under a duvet along with two soft blankets. Often with my cat. I wish I could sleep with Rusty at least sometimes but he would inevitably get into the closet (there’s no door there) and try to eat plastic. So he’s allowed into the bedroom only under the strict supervision. My goosedown duvet came out of storage not long ago and in the cold snap we are having this weekend I am grateful for the blanket on top as well. I do also have a couple of microfibre duvets that replicate the feel of goosedown up to a point, and which are easy to wash. But nothing beats the real deal. May I ask what tog yours is, if you have a similar system there? Rusty does look very comfy on it I must say! Ubar I remember finding ‘too big’ and ‘too animalic’, but after my surprise epiphany with Salome, anything is possible, and I’d gladly revisit it! Tog?!! I’m not there yet :) All I know about my latest comforter is that it’s “medium.” But then I went to the manufacturer’s website and learned that it has a “Fill Power: 700+”. The one I have – a queen side – weights 35 oz. I finally put a thin down duvet on my bed last week, when it gets a little colder, I’ll swap it to a thicker one. I’m in love with my thicker one but I can enjoy it only short time in the coldest months, otherwise I’ll be cooked under it. ;) Talking about Ubar, is it just me to think that the colour of the bottle curiously goes well with Rusty?? I plan to get myself a summer down duvet as well eventually but for now I’m happy with my winter one. I am allergic to cashmere (and wool and mohair) so the perfume comparison usually leaves me cold (so to speak) but your comparison is spot on! I’m surprised that more people aren’t allergic to mohair: I think of it as of a very strange substance and avoid clothes made of it. But I’m sorry that you have to find substitutes for wool. How about animal fur? Are you allergic to pets? I’m starting to think it’s almost time to get the second duvet out of the wardrobe and onto the bed. (The cats will be delighted, as they like to build nests between the layers.) There are few things as pleasant as being glowingly sleep-warm under a pile of feather/down quilts when the room is cold. I remember pleading with my parents for a duvet, back when they were given the suspicious side-eye for being somewhat alien in England–they still get called “continental quilts” by some, after all–where sheets and somewhat scratchy blankets were the norm. Perhaps with a rather stingy eiderdown quilt on top, more as decoration than as real bedding. Crinkey, thank you for the interesting insight into the state of things from your childhood: it’s something that is almost impossible to imagine based on one’s own experiences and these are so small and mundane that usually people from different backgrounds don’t bring up but those nuggets of life are extremely interesting. I need to wear Chergui: I waited for the colder weather for it as well. I’m not sure I would like to sleep on something soft (I prefer a very firm mattresses) but sleeping under something soft feels great. Being a night person, I wouldn’t want to switch to the natural light concept. My ideal world is such in which everybody can follow their own schedule but have enough time for cooperating with people on different internal clocks. I have a pile of very soft and blankets (3 to be precise) that I snuggle under in dreamland, none of which are down but serve their purpose. Where I find down to be really super is in my puffer coat…so light yet so warm. 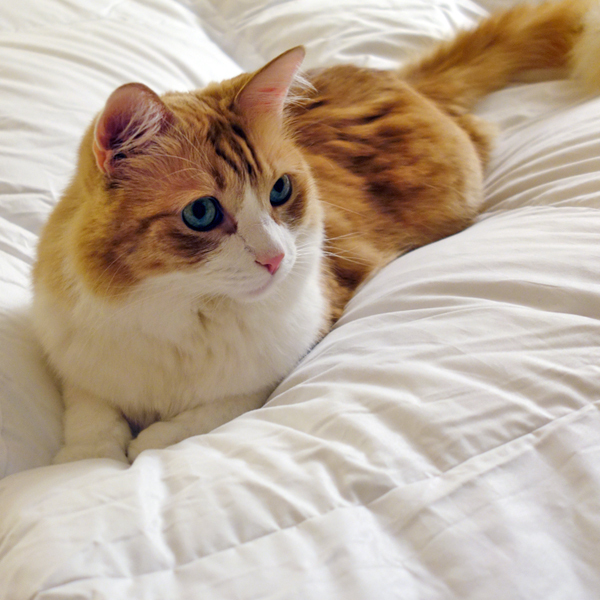 Rusty looks so gorgeous against the white duvet backdrop…well, he is just plain handsome regardless of where you take his picture. Does he snuggle under the duvet as well? He would have! But we don’t let him into the bedroom unless we’re there, awake. So maximum freedom he gets is to lie (or jump) on top of the duvet looking extremely cute. After reading how everybody else’s cats love to nest under the blankets, I started thinking of getting Rusty his own blanket (or maybe I should let him use our old comforter?). 100% with you on the down comforter Undina. Add fresh cotton or linen sheetings and you have found one of my very special heavens. Ubar is all about the hot weather for me. Funny how everyone has different ways to love their frags. It is interesting indeed how differently we place our favorites against seasons. Loved this post and how you sit in your office dreaming of being under your down comforter. I can relate. How nice to have a perfume that gives that feeling. Being warm in bed is VERY important to me. After years of fearing an allergic reaction I got my first down duvet this year. It doesn’t seem to have much of an affect. I tend to be prone to the sniffles anyway. But I must tell you that I have two, one medium and one thin, that have “poppers” on each corner which attach them together for the winter to make one thick duvet. So I’m covered year-round (excuse the pun)! I also swear by a brushed/fleecy fitted sheet. Sooo cosy compared to plain cotton. I haven’t tried Cuir Fetiche but I agree that many of the leather-themed perfumes also work better in cooler weather. Let’s exchange samples! I can send you Ubar. Send me your shipping address to my e-mail (see the About page or my gravatar) and I’ll send you mine. Yes, it was a date with my new duvet :) We just got it (a week ago – right before it was time to switch to a winter comforter) and since then I sleep a lot better. Awww, Rusty looks tres cute! I usually think of him as being green-eyed, but in this photo his eyes look clear blue. Undina, I can understand exactly why you see Ubar as a down comforter, as it’s such a plush, cushiony perfume (though I’ll admit that I am partial to wearing it in summer, as it seems to meld with my skin better then). I really enjoyed hearing your story of how your grandmother made you a down comforter – that’s such a labor of love! Do you still have it? Rusty’s eyes are yellowish-green, it’s just the light. That comforter that my grandma made for me is long gone, but I used it for more than 10 years. I should try wearing Ubar next summer: who knows, maybe I’ll like it any more? And Rusty loves the down as much as you do or more! Our cat seems to know where every comforter is stored in the house, and manages to nest in them even before I can get them washed for the season. Down is seasonless for Miss Charcoal! Love the cold weather perfume list. Mitzah is one of the Diors that I missed out on, but a delightful and warm (Not cashmere!!) wrap it is. If you need some more Mitzah – just to see closer what type of a wrap it is, – just whistle! Hi Undina. I’m down with your winter perfumes and your love of the duvet. I need to get Ambre Sultan and Coromandel out of their hiding (storage) space. And I’m so guilty of using the cashmere analogy! Although currently my wrap of choice is a huge fake fur blanket that is super snuggly. I already wore both – Ambre Sultan and Coromandel – in the last month and they felt just right! So right! You can’t go wrong with these. Your post prompted me to get both out and smell them. So good. Interesting post. As a Scandinavian I obviously own duvets, and I prefer the real thing to any polyester filling. I do sometimes wonder how people keep their duvets kleen if they do not put a removable cover on them. I find blankets are usually so heavy, a duvet is so much better. I cannot stand the envelope feeling of traditional English bedding (and it is often similar in Continental Europe). I should get around to trying Ambre Sultan this winter. I find Coromandel works during all seasons, if it is dry weather. For the first couple of years in the U.S. I suffered a lot because I couldn’t find a duvet cover and hated to use the sheets. Now it’s much easier to find those (though good ones are unpleasantly expensive). I think my division of perfumes are more psychological than factual, at least for some perfumes: I mentally assign them to different seasons and then they just do not work out of the designated time of the year/weather.